Early morning, after breakfast at our hotel – tour guide take us to Sea Lady Museum. 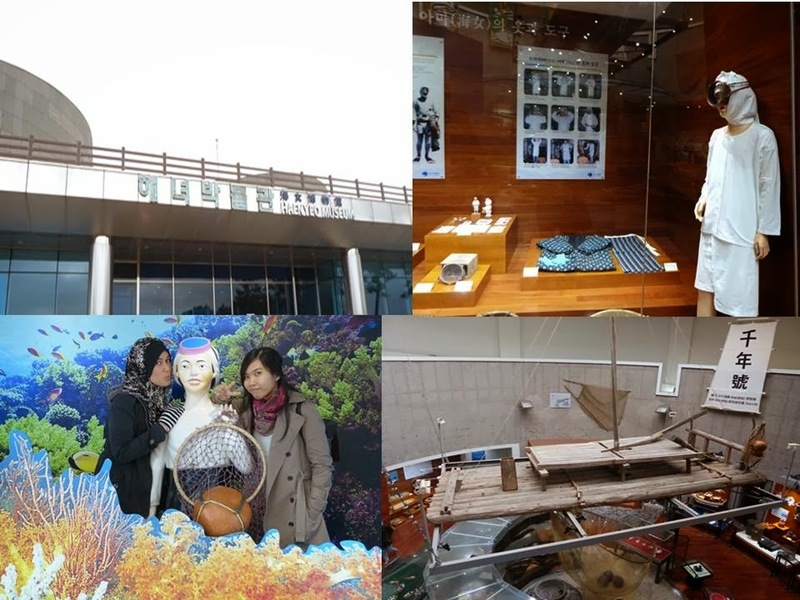 This museum tell us about the real life of some Jeju ladies that the main work of them is the collected the abalones, seaweeds and more at around Jeju sea areas. Actually, the age some of them are almost 70 – 110 years old and their still strong and work as collected abalones until now. They start do this work since their 12 years old. They also still using some traditional method when their work. Before we start tour around inside the museum, the museum workers show us the movie about the reality life of Sea Lady at Jeju Island. For me, this movie so touching and sad even thought its history movie. This movie only takes around 10 – 15 minutes. Then, we go to Seopjikoji. 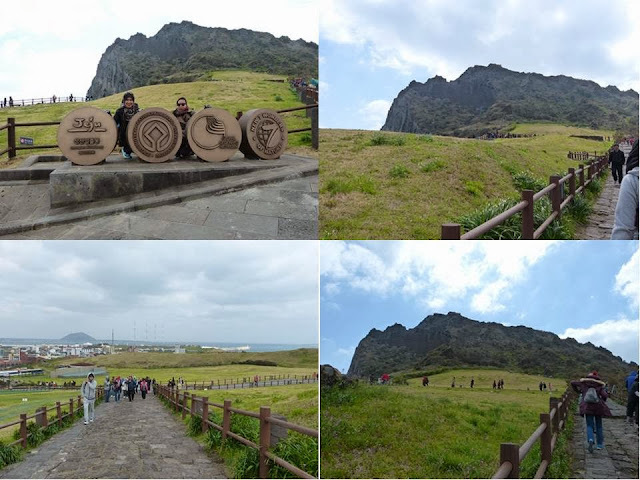 Seopjikoji is located at the end of the eastern shore of Jeju Island. 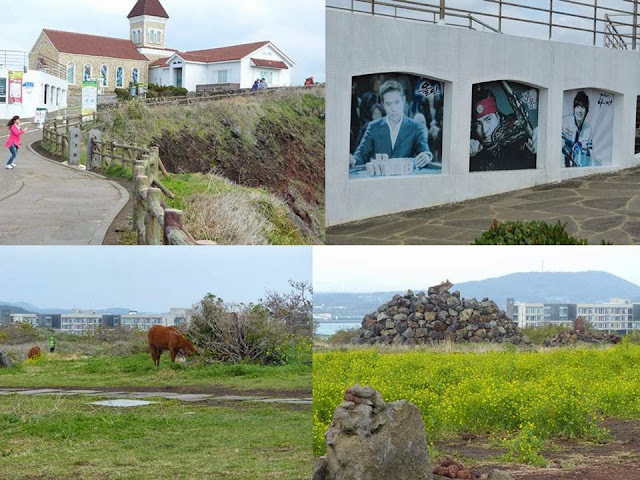 “Seopji” is the old name for the area, and “Koji” is native Jeju dialect means “small gulf”. This place is so famous filming location for the Korean drama “All In”. This place so beautiful and at the same times is so cold too because of the wind so strong on that day. This is a huge expanse of grassy field adjacent to the sea. From the shore, I can enjoy a beautiful rocky coastline, and the strange stones that appear and disappear with the tide are a unique spectacle. Then, the third place to visiting is Seongsan Ilchulbaong Peak (Sunrise Peak). 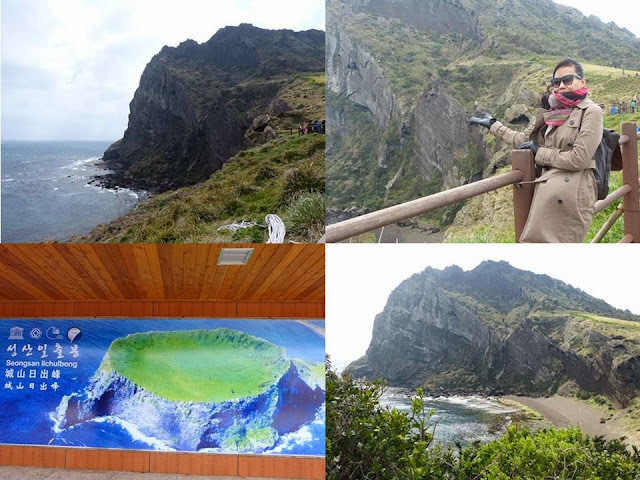 Seongsan Ilchulbaong Peak (Sunrise Peak) is a land mass that was created about 100,000 years ago and it was above 182 meters above from the sea in a volcanic eruption. At Seongsan Ilchulbaong Peak, there is a cliff by the seashore, where is not a single tree, only a large field of grass and on the seashore, there is a rock called “seondol” sticking out. Actually, I want to climb until I saw inside of Seongsan Ilchulbaong Peak but the temperature on that day is so cold and I can’t handle well even though I already wear four layer clothes. I and my friends only take picture around area Seongsan Ilchulbaong Peak. This place is so beautiful and natural. This tuff cone formed when an underwater volcano erupted in the middle of the ocean. Seongsan Ilchulbaong Peak (Sunrise Peak) was designed National Monument No.40 in 2000 and a UNESCO World Natural Heritage Site in 2007. Not so surprised, because Seongsan Ilchulbaong Peak (Sunrise Peak) is one of filming location of Korean drama “My name is Kim Sam-Soon”, when Huijin (Jeong Ryeo-Won) and Henry (Daniel Henney) went on a date. We take lunch at Korean restaurant that just near by at Seongsan Ilchulbaong Peak (Sunrise Peak). The menu of our lunch is seaweed soup and fry fish. The special of this restaurant that take my attention is it has welcoming banner at in front the door that write “Selamat Datang” and at back the door write “Terima Kasih and Jumpa Lagi.” That mean the owner is warm heart to the Malaysian tourist for coming to the Jeju Island. 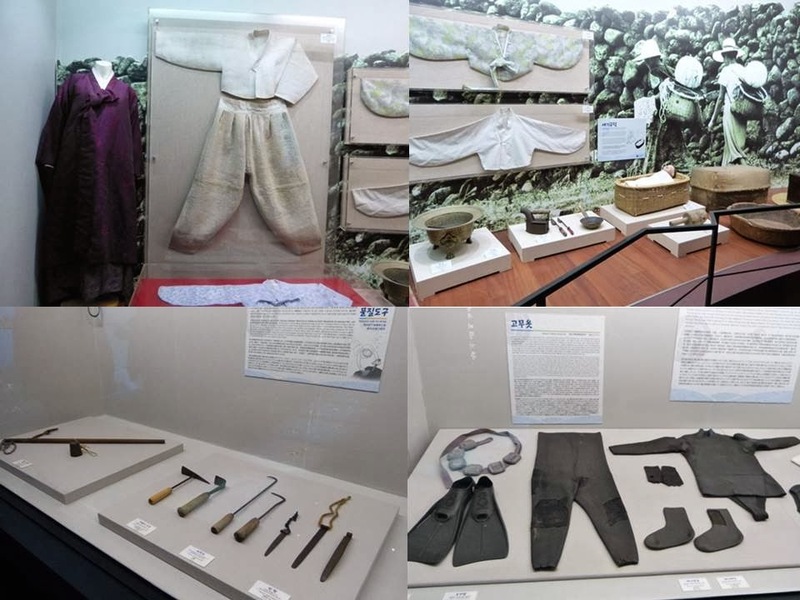 Then, we proceed to the most history place at Jeju Island is Jeju Folk Village Museum. Its way of life is protected, as it has been designated a Folk Village because of the vast amount of cultural property here. In Jeju Folk Village Museum, it’s telling us about the culture and history of Jeju-do Island during the 1890s, has been recreated in this outdoor museum. Houses and architectures of mountain villages, fishing village, governmental offices, and such of Jeju-do have been restored here. This is where Janggeum, the main character of the popular Korean drama “Jewel in the Palace”, was exiled to. Their still keep the some of the drama shooting things in the Jeju Folk Village Museum so korean drama fans can saw it by their own eyes. After that, we go to Trick Art Museum. This museum shows the amazing trick art and it look so real when we follow the instruction of each picture inside the museum. I enjoy and fun inside this museum. It makes me laugh and their creative so amazing. I think the famous picture in this museum is the angel’s fly; I not miss to take picture on that picture too. Everything in this museum look so real to me. I like it so much..
We enjoy ride ATV Mini before we go to the Jeju Mini Land. It’s only beside the Trick Art Museum. Honestly, it so fun for teenager tourists but not to old tourists. Then we proceed to Jeju Mini Land. This place displays smaller version of the world renowned landmark buildings and cultural heritage. If you guys still remember this place is the shooting site of Korea popular variety show “Running Man”. But during I go there, some area are close for renovation so I can’t find the same place that they go in Korea popular variety show “Running Man”. I only can find a few place that same in Korea popular variety show “Running Man”. Before we go for dinner, we were enjoying the great view of Sakura or know as Cherry Blossom at Jeju Island. We know at Seoul in early of April, 2013 is still cold so it’s not have blooming Sakura flower or know as Cherry blossom, because at Seoul is still too cold than Jeju Island – Sakura flower will blooming around temperature 13-15’C. But at Jeju Island, Sakaru still blooming and it’s not so many because it’s almost end of Sakura season at Jeju Island area. Our driver bus so kind, he takes us to the most beautiful place of Sakura flower at Jeju Island before our dinner. This is first times; I saw the real Sakura flower in my life. It’s so beautiful and Sakura flower is my favorite flower. I was so happy after enjoy watching and take picture at Sakura flower’s place. One of my dreams is come true, after watch and feeling touch the real Sakura flower. The menu of our last dinner at Jeju Island is seafood. Our table full with fresh seafood from Jeju Island. It’s so delicious and fresh to me. I love it. Then, we proceed go back our hotel to rest and packing because next day we have to flight back to Gimpo Airport. Here, my story of day 3 during my vacation. To me, Jeju Island so nice and beautiful to me. 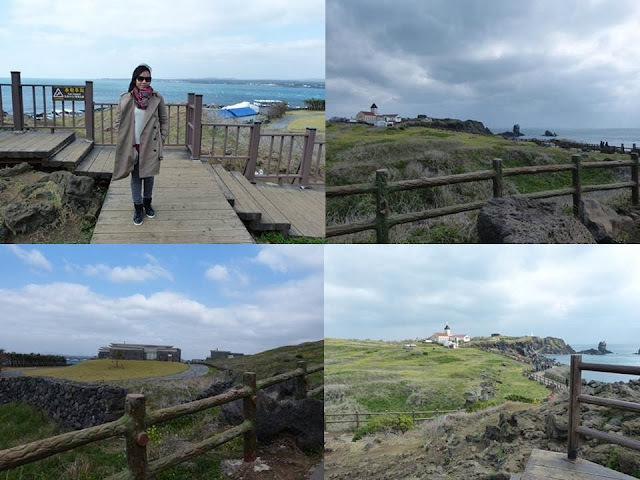 It is so sad to said goodbye to Jeju Island. Wait, my stories of day 4 at Korea Vacation..